I always enjoy sculpting new stones Recently I purchased a beautiful piece of Serpentine marble. Serpentine varieties are found in many places in the world, including Canada(Quebec), Afghanistan, Britain, Cyprus, Greece, China, Russia (the Ural Mountains), France, Korea, Austria, India, Myanmar (Burma), New Zealand, Norway, Italy and the United States. It had an interesting shape and green color before I started to work with it there was some delicate veining which I wanted to incorporate into the design. As I worked the stone I found it very dense. As the sculpture took shape the veining was more visible. 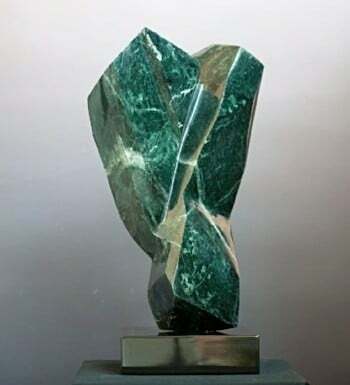 The final sculpture completed suggested a large emerald jewel.